is in the Canadian Golf Hall of Fame. OAKVILLE, Ontario, Canada (July 27, 2017) -- At Glen Abbey Golf Club, master craftsmen Bob Vokey was inducted into the Canadian Golf Hall of Fame in the builder category, along with Judy Darling Evans in the player category. The pair became the 78th and 79th honoured members of Canada’s highest golf shrine. The event was part of the opening ceremonies for the 108th RBC Canadian Open — the third oldest national open in the world, after the British and the U.S.
Born in Montreal, Quebec, Vokey, 77, is one of the world’s foremost wedge designers, making Titleist Vokey wedges a trusted brand among golfers across the globe — from juniors just learning the game to rising amateur stars to PGA Tour pros. Over the years, the master craftsman has designed wedges for many of golf’s legends – past and present – including: Seve Ballesteros, Lee Trevino, Bernhard Langer, Ernie Els, Sergio Garcia, Tiger Woods, Jordan Spieth and Rory McIlroy. “In all my years I never could have dreamed that this honor would come my way,” he said at the ceremony. One of the greatest players ever - Jack Nicklaus - was one of the many honorary guests. 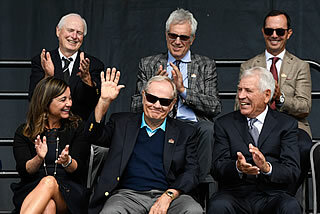 What made the day even more special for Vokey was that 17 legends of Canadian golf were on hand to witness his induction, including such legendary amateur golfers as Marlene Streit, Gary Cowan, Jocelyne Bourassa, Mary Ann Hayward. In attendance to witness Vokey’s induction were at least a dozen representatives from AmateurGolf.com sponsor Titleist, including President and Chief Executive Officer of the Acushnet Companies: Wally Uihlein.